Menulog delivers for Beach Burrito Co - Cronulla so you'll be able to track your courier on a map. Corn chips served with guacamole and smoky salsa. Tempura battered onion rings. Served with chipotle aioli. Flash fried beef or chicken tacos drenched in lime and chilli. Oven roasted jalapenos filled with cream cheese, lightly crumbed and flash fried, served with chipotle aioli. Make It Californian: Replace your Rice and Beans with Hot Chips. Slow roasted beef, pickled cabbage and onion, lettuce, sour cream and traditional salsa. Served with Mexican rice, black beans and blend of finely shredded cheese. Pulled pork, pickled peppers and cabbage, pineapple salsa and chilli agave roasted peanuts. Served with Mexican rice, black beans and blend of finely shredded cheese. Chipotle chicken, traditional salsa, pico de gallo, guacamole and sour cream. Served with Mexican rice, black beans and blend of finely shredded cheese. Chipotle chicken, sour cream, pico de gallo, pickled cucumber and green goddess salsa. Served with Mexican rice, black beans and blend of finely shredded cheese. Sweet potato wedges, halloumi, pickled cabbage, peppers and cucumber, pico de gallo and traditional salsa. Served with Mexican rice and black beans. Sour cream, pico de gallo, pickled cucumber and green goddess salsa. Served with Mexican rice, black beans and blend of finely shredded cheese. Battered fish, pickled cucumber, pico de gallo, Blanco salsa, lettuce and burnt orange salsa. Served with Mexican rice and black beans. Chickpea fritter, Mexican rice, black beans, pico de gallo, pickled cabbage, pickled onion, smokey salsa. Beef, pork, chicken, chilli con carne, pickled onions and cabbage, guacamole, traditional salsa, lettuce and sour cream. Served with Mexican rice, black beans and blend of finely shredded cheese. Chipotle chicken, hot chips, lettuce, jalapenos, tomato sauce and chipotle aioli. Served with blend of finely shredded cheese. Pork, chicken, pico de gallo, shredded cabbage, chipotle aioli and guacamole. Served with Mexican rice, black beans and blend of finely shredded cheese. Battered prawns with toasted coconut, lettuce, corn salsa, guacamole and mango jalapeño salsa. Fried chicken, Mexican Rice, black beans, cheese, jalapeño slaw, corn salsa. Chilli con carne, Mexican rice, pico de gallo, cheese, lettuce, sour cream and guacamole. salsa, pickled cabbage and pickled onion. Your favourite burrito lightly toasted then smothered in our spicy fajita style salsa and topped with cheese, lettuce, and jalapeños. Served with corn chips, pico de gallo, guacamole and sour cream. Flash fried burrito filled with Mexican rice, cheese, salsa and beef. Served with salsa and side of pico de gallo, guacamole and sour cream. 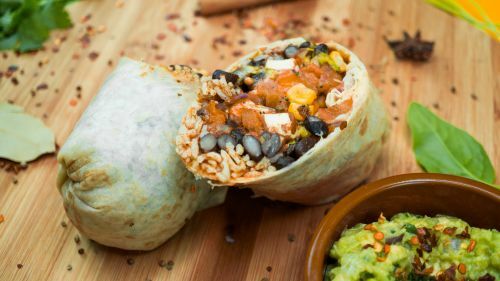 Flash fried burrito filled with Mexican rice, cheese, salsa, roasted vegetables and tofu. Served with salsa and a side of pico de gallo, guacamole and sourcream. Flash fried burrito filled with Mexican rice, cheese, salsa and chipotle chicken. Served with salsa and a side of pico de gallo, guacamole and sour cream. Fried chicken, rice, lettuce, cheese and tomato sauce. Battered fish served with hot chips and tomato sauce. Chipotle chicken, lettuce, spinach, quinoa, cabbage, corn salsa, sweet potato wedges, green goddess salsa and mango jalapeño salsa. Halloumi, lettuce, spinach, quinoa, cabbage, corn salsa, sweet potato wedges, green goddess salsa and mango jalapeño salsa. Battered prawns with toasted coconut, lettuce, spinach, quinoa, pickled cabbage, corn salsa, sweet potato wedges, green goddess salsa and mango jalapeño salsa.